So we’ve got our characters figured out. We’ve spent hours upon hours making sure the mouth is just the right distance from the eyes and we are just too tired to continue any alterations. Now comes a little thing we’ve found to be very helpful: the Animatic! The animatic is your storyboard. The only difference is that you can add motion and sound to get your timing right. Doing this now is so much easier than altering a high-quality animation down the line. Saving time and sanity is essential in animation since every other aspect of it can be soooooooo so tedious. 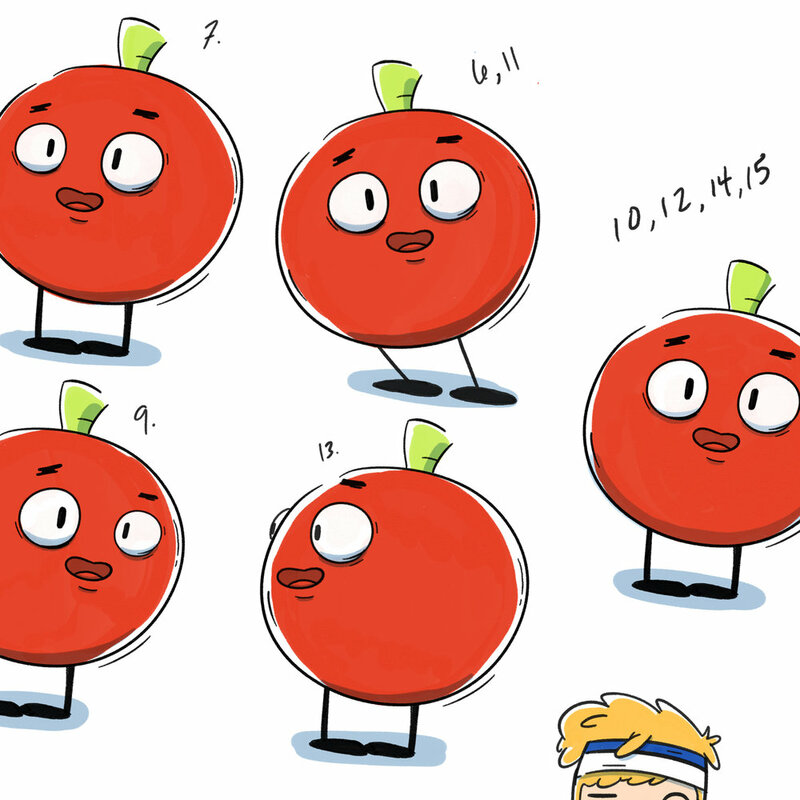 Check out the animatic for our Tomato promo video below! 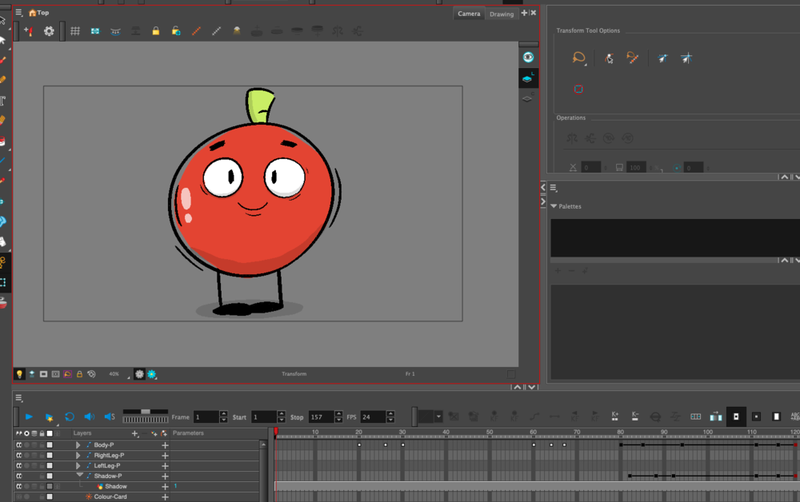 Test animatic for a promo video starring a tomato. We’ve got our story, our characters, and now even our timing and sound down. After you’ve sent your animatic to your mom and she’s told you how wonderful you are, it’s time to get down to the dirty work of animating your final version. Whether you use ToonBoom Harmony (our favorite) or the corner of your Sociobiology textbook, animation is not for the faint of heart. So please, if you have any existing heart conditions, consult your doctor to see if animation is right for you. Have you ever wondered what goes into making one of our award winning (ha) promotional videos? No? Oh. Well…would you want to learn anyway? Just keep reading if the answer is “yes” or press the back button on your browser if the answer is “no”. Stand in the shower and waste copious amounts of hot water while your brain muscles start the creative process. Now, it is very important that the water is running. Without the nagging feeling that you’re wasting something so precious to other countries, you won’t feel the pressure to deliver results. Even the smallest kernel of an idea is a good enough start. At this point, feel free to turn off the water. Here, we like to scribble down that tidbit we found in the shower. No, I don’t mean the dried clump of shampoo that squirted against the wall when you tried to use the pump. I mean the idea that the rest of your promo is going to grow from! Grab a notebook, a Kleenex, or even write on the foggy bathroom mirror (just don’t be angry when the ink evaporates with the steam). Write your idea so it can start to incubate. Now comes the visualization! We like to grab some graph paper to outline some thumbnails in a grid fashion. The small size of the thumbnails keeps us from focusing on too much detail. You really want to outline the story here. Don’t even focus too much on what the characters are going to look like - just get a working idea! Here’s the point where you can start working out your characters. Sometimes this takes us weeks to do and sometimes we love the first attempt (like what happened here with Tom). Our Character Model of Tom. It’s rare but we were happy with our first go at this little vegetable. Fruit? Legume? Who even knows? Give your character some turnarounds (a front view, a profile view, a 3/4 view, falling out of a spaceship view). Try out different emotions. Stretch him to the limits in case something catches your eye. Hate him entirely? Draw a new character beating the old one mercilessly. Hopefully this is a good spot to leave you at for now! Look out for Part 2 where we tackle an Animatic (moving storyboard) to get our timing all set! Then come the backgrounds and the start of our animating!